We are a Community Amateur Sports Club and have three full-size lawns in a favourable position at the top of Calverley Grounds in the centre of Royal Tunbridge Wells. To find us see the Google maps image on the right or Our Location page. For details about how to join us see our Membership page. Our Clubhouse has changing rooms and kitchen facilities, including a dishwasher, for limited refreshments, including tea, coffee, biscuits etc. More extensive teas and lunches etc. can be found within Calverley Grounds at the Cafe (2 minutes walk downhill) or in the main shopping area of Tunbridge Wells itself (5-6 minutes walk to the far side of the car park in Crescent Road). Our decorations include some croquet sketches, donated by John Hobbs, and a drawing of the club house by Barbara Tasker. 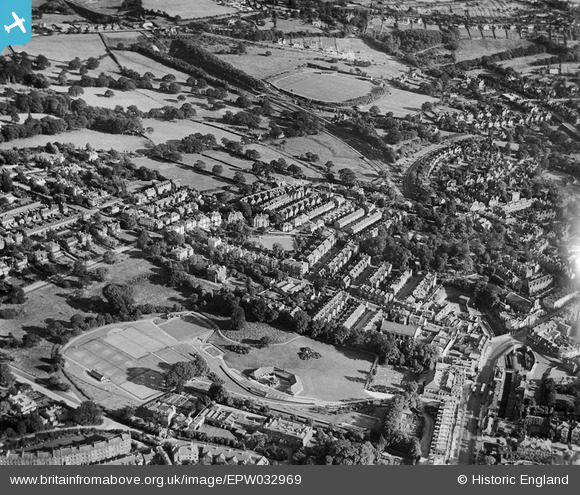 This photo shows what Calverley Grounds looked like in 1930. We are where the tennis courts are in the bottom left of the photo, (courtesy of http://www.britainfromabove.org.uk). Click on this image for a larger version. Members may play at any time from dawn to dusk, seven days a week, gaining access using the provided key. We provide all hoops, pegs and balls as well as a selection of mallets. Each lawn has its own equipment with two sets of coloured balls on trolleys. Flat-soled shoes are essential; normal sportswear is worn most of the time, with whites for tournaments and inter-club matches. Club Afternoons are Wednesday and Sunday 2-6pm from (roughly) April to September. During the winter we normally have a club day on a Sunday once a month. These are informal and social occasions, suitable for those new to the game as well as experienced players. 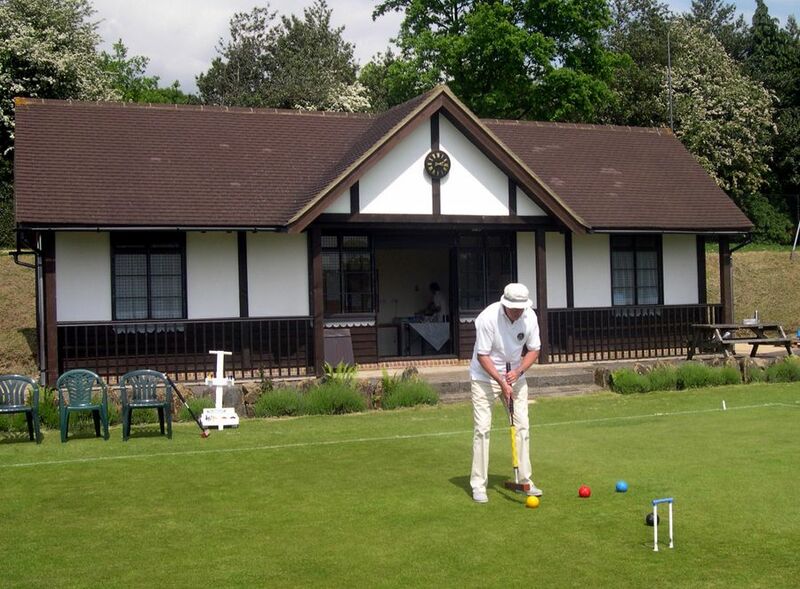 We typically get between 10 and 25 people in the summer, playing both Golf Croquet and Association Croquet, so feel free to just turn up if you already play! If you don’t already play then we suggest that you come to one of our Open Days (first Sunday afternoons May-August). At most sessions coaches are available to provide informal help and assistance. We also provide more regular coaching. Please see here for more information. We also have a library of books and magazines for loan free of charge to members. Visitors, especially novices, are welcome on one of our Open Days free of charge for the first visit – these are the afternoons of the first Sundays of May to August. During our normal club sessions it may be possible for novices to play, provided this is agreed in advance so that tutors are available and normal green fees (below) are payable. Visitors who are members of another croquet club are also welcome. As guests of members, or during one of our club sessions, you can use the lawns on payment of green fees. These are £4 per person per half-day or £7 per day for a maximum of three sessions or days. Other non-members must either be a guest of a member or be part of a Private Event. We’re also grateful to all the members who’ve donated money to us over the years and especially to Hazel Moss-Davies who provided the funds to build our clubhouse in 1995. Use the About Us sub-menu for much more detail about us. We can also host private parties or corporate events. See the Events Page for more details.